In continuation of our effort to deeply understand the reactions of triazinone, we carried out the optimization of sodium acetate, which is utilized as a catalyst in the reaction mechanism. 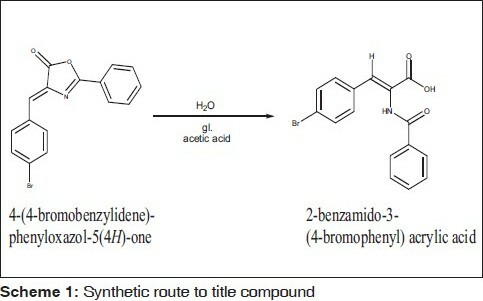 We carry forward the synthesis of triazinone, which begins with 4-(4-bromobenzylidene)-2-phenyloxazol-5(4H)-one and acid hydrazide. During reaction monitoring, a light spot started appearing on the thin layer chromatography (TLC) after 4 h of the commencement of the reaction, which eventually deepened after 12 h. On cooling, this reaction mixture produced white colored crystals, which were earlier presumed to be triazinone. The fourier transform infrared (FT-IR) spectrum reflected the presence of two sharp stretchings above 3,000 cm -1 , but it was expected to be only one. The two sharp stretchings were observed at 3456.39 and 3231.78, which signifies the presence of two acidic protons, i.e., -NH or -OH, while in 1 HNMR spectrum, a singlet was expected for -CONH at 11-12 ppm, which was absent in our spectra. Instead, a singlet appeared at 9.6 ppm; apart from this, the presumed number of protons was 18, which was found to be only 12. Also, the total number of singlets were expected to be 2 (-CH, -NH), which were found to be 3, of which 2 were displaceable. This suggested the presence of two acidic protons in the synthesized compound. Further, the mass spectra showed a peak at 368, which was expected to be at 475. On further investigation of 1 HNMR and mass fragmentation pattern, it was found that the synthesized compound was not triazinone; rather, it was a hydrolyzed product of 4-(4-bromobenzylidene)-2-phenyloxazol-5(4H)-one, i.e., acrylic acid derivative, having molecular weight 345, which appeared at 368 (with the peak of Na + ) in our spectrum. This was further assured by separately carrying out the hydrolysis of 4-(4-bromobenzylidene)-2-phenyloxazol-5(4H)-one in glacial acetic acid [Scheme 1] and comparing its TLC and spectral data with our synthesized compound. This acrylic acid derivative is not yet reported. 1. Kaushik D, Khan SA, Chawla G. Design and synthesis of 2-(substituted aryloxy)-5-(substituted benzylidene)-3-phenyl-2,5-dihydro-1H-[1,2,4] triazin-6-one as potential anticonvulsant agents. Eur J Med Chem 2010;45:3960-9.